Four parishes - Ballycroy, Belmullet, Kilcommon and Kiltane (all in the old parish of Kilcommon) are dealt with alphabetically on a townland basis, in this 368 page book by Father Seán Noone. Supplemented with interesting maps and 56 pages of photographs spanning many decades, the book is the result of research over a period of ten years and is dedicated to emigrants from Erris whose search for a living took them away from a place of fond memories. The author expresses a wish that all emigrants find among the pages a deeper knowledge and appreciation of the land of their birth, which is proud to claim them as its own. Proceeds from the sale of this book will go to the Hospital and Saint Deirbhle's Nursing Home, at Belmullet. 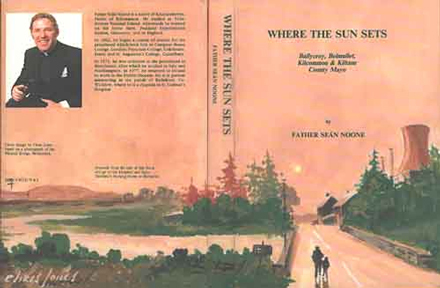 When Father Seán Noone asked me to write an introduction for his book he kindly sent me the first chapter which sketches the historical background to his study and gives an over-view of its scope. What I have read served to whet my appetite for the feast of history, information and anecdotes contained in the following pages. This is the history of the ancient parish of Kilcommon which once comprised the whole of "mainland" Erris and was the largest parish in Ireland until its division into the present-day parishes of Kilcommon, Belmullet, Kiltane and Ballycroy. Father Noone is not simply 'laudator temporis acti'. In undertaking this labour of love he had a dual objective: to share with others his immense knowledge of and affection for his own place and roots in the Diocese of Killala, and to foster in all Erris people, at home and abroad, an awareness and love of their precious Irish and Christian heritage. In 1962, he began a course of studies for the priestood whch took him to Campion House College, London; Franciscan College, Colchester, Essex; and St. Augustine's College, Canterbury. In 1971, he was ordained in the priesthood in Manchester, after which he worked in Italy and Northampton. In 1977, he returned to Ireland to work in the Dublin Diocese. He is at present ministering in his home parish at Pullathomas.